One of my favorite movies of all time is Breaking Away. Dave Stoller, the protagonist in that little tale gets his chance to race against the Team Cinzano, his idols. Unfortunately it doesn't work out the way he thought it would, the pro riders recognize him as a threat and toss a pump into his wheel, sending him in a ditch. After the race he comes home crying, puts his arms around his mother and says, "everybody cheats, I just didn't know". I keep thinking of that scene as I read yet another SEC scandal, this time backdating options. It's interesting to read the following two articles one after the other. There are two explanations for this. One is that the CEOs of these companies have the incredible ability to pick the exact bottom of their company's stock price every single time without fail. If this is true, then these men (and they are all men) are probably actually underpaid for their remarkable ability to predict the future, since the odds of choosing the right date every time for all the different companies is something like a quadrillion to one against. FloJo had a fantastic year in 1988, which is why she raised so many eyebrows. She wasn’t Beamon. She was Bonds. I think if we’re smart about it, we can learn to distinguish the fluke performances from the phony performances. Essentially the same argument. It follows that any performance which is so statistically improbable, is very probably the result of cheating. But in the case of CEOs, we tend to not give the benefit of the doubt, but in the case of athletes we do. I take it, from many of the comments on my last post, that virtually no one bought my idea for loosing the forensic economists on sports records. Found via rentzsch.com. One of the many differences between Wolf Rentzsch, and myself: I'm an admitted criminal when it comes to public transportation. With the three kids keeping me hopping, I guess this kind of thing just sort of slipped past me. So to follow a local team you're either listening to the radio, or you're paying $60+/month to cable? When did this happen? I used to be able to watch Red Sox games growing up on WSBK TV 38 for nothing. Ok the reception kind of stunk, and I had to delicately balance the UHF dial in the zone between 38 and 39, and occasionally it would flop over to one side or the other and turn the screen to white fuzz. But it *was* free. My TV will go out on the stoop with the trash before I pay $60/month in cable fees. I've given up commuting on my local bike path for the rest of the summer. There are just too many people walking and running with ear buds in, iPods blaring. The nicer the weather has become the more I found myself dodging oblivious zombies shuffling along. Never their minds on where they are, what they are doing ... they are reckless (thanks Yoda). 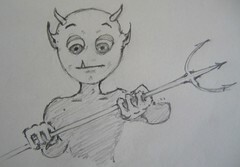 This week's Illustration Friday topic was Angels and Devils. As it turned out, I had done a bunch of sketches of an icon for an open source project called Loocifer. To be honest, I'm not sure what the project is about exactly. But the name certainly lended itself to a certain Devil theme. Here's the progression of images. The feedback for the first was that it was too "real". From the second, they liked the top left but maybe try it without a nose. The third was the final sketch, and then the icon that jakedahn put together in Illustrator. He did a really stellar job on it I thought. I've been not-so-subtley suggesting to a friend of mine that he should really consider taking Caltrain for his commute. I've been dropping these hints for, oh, a couple years now. I guess the combination of $50 for a tank of gas and one too many bumper-to-bumper commutes home from San Jose finally pitched him over the edge. This was his first week of commuting on the train. Bravo! Modern English is now hocking Ritz Crackers. Animated CG crackers dance to I Melt With You, as they combine with cheese slices ... get it? I didn't either. My wife yelled in pain. I retched.